Mouse over image to zoom. Left click to view larger. Any watermark seen on image does not appear on actual item. 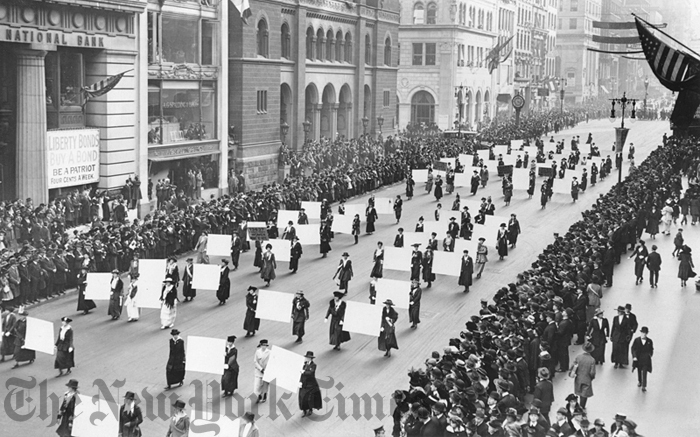 Advocates march in October 1917, displaying placards containing the signatures of over one million New York women demanding to vote. Photo from The New York Times Photo Archives. Each exhibition-quality print meets the highest photographic standards and is individually created with the finest ink and fiber-based archival paper. Unframed photos ship in 3 - 5 business days. Framing adds 2 additional production days. Expedited shipping will not shorten production time. © 2014 The New York Times. All right reserved. Photographs and other printed materials are for personal use only. Publication, reproduction, use in advertising or for purpose of trade is prohibited without written permission.